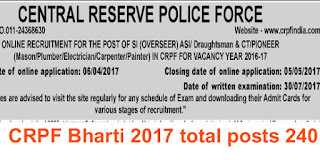 Age limit : For the post of ASI/Draughtsman, the age will be determine 18 to 25 years and for all other posts, 18 to 23 years will be calculated. Extra age relaxation will be conciderd as per Indian government rules. For example 5 years relaxation for ST/SC, 03 years for OBC. ASI/Overseer : Intermediate with three years Diploma in civil Engineering. Masson/Plumber/Electrician/Painter : 10th class pass from recognized board. One years experience in respective trade. Candidates having certificate under national skill Development agency under Govt of India, will be eligible for aditional 5 marks during trade test. 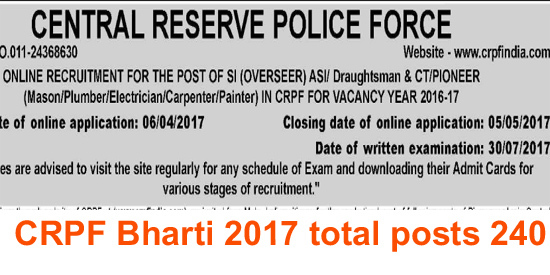 Note : Online application is available at official website www.crpfindia.com. Its an incredible joy perusing your post.Its brimming with data I am searching for and Click the Following Post I want to post a remark that "The substance of your post is marvelous" Great work.